Are your Sundays spent dreading work on Monday? Have you been "climbing the ladder" for years only to find out that the ladder's been up against the wrong building? Are you tired of hopping from one job to another without any sense of direction or enthusiasm? Are you ready to take a leap, but you want to make sure it's going to be right this time? Have you read career books, taken career tests, maybe even seen a career counselor and find you're still in a career that doesn't excite you? You're enthusiastic and leap out of bed most mornings excited about the day ahead. Your work comes so naturally to you that you make it look easy. You're paid very well to do something you consider fun. You work in an environment that allows you to be yourself and helps you reach your ultimate potential. At the end of the day, you're energized instead of feeling exhausted and/or stressed out. For over 15 years, Oxford has been the ultimate career choice/change guidance and testing program. 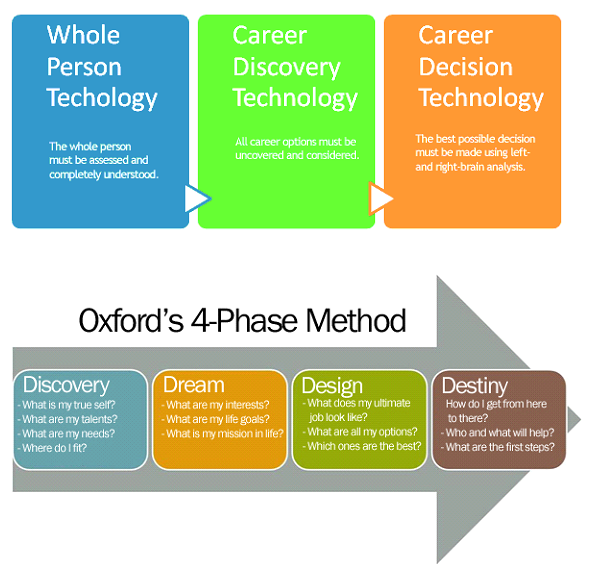 The Oxford ProgramTM is an online career counseling program specially designed to help people (who feel "stuck" with a complex career choice/change dilemma) discover their "natural vocation" and have it all: a career they absolutely love and that pays them what they need. It succeeds where conventional career counseling has failed in the past. Our clients are "enlightened" people who want to wake up in the morning and look forward to work; who realize their career is too important to trust to fate or help wanted ads or their families well-intentioned advice. You may already know from first-hand experience that conventional career advice books and tests are too primitive to be of much help. AND...studies have shown that people who naturally fit their career aptitude-wise and personality-wise make, on average, from $3000 to $90,000 more per year than people in the same career who are a poor fit? Why is the Oxford Program so effective and inspiring? It comes down to our ground-breaking, 4-phase process and most empowering arsenal of tools known to the career counseling profession. PHASE 1: UNDERSTAND HOW YOU ARE UNIQUE AND WHERE YOU ARE MOST TALENTED. This is the cornerstone. Without this cornerstone, you’ll flounder like thousands of others who are trying to find their way out of the wrong career. It’s a fundamental concept that’s been around for thousands of years. To assess this, in the program you'll complete the Highlands Ability Battery. PHASE 2: DEVELOP A NEWFOUND AWARENESS OF YOUR PASSIONS, AN OPTIMISTIC SENSE OF PURPOSE, AND A PROFOUND UNDERSTANDING OF WHAT YOU MUST DO WITH THE REST OF YOUR LIFE. By delving into each of the following areas, you get closer to knowing your true self, the part of you that has a clearer sense of what you need and where you have to go in life. You feel optimism and confidence from your newfound personal vision and sense of purpose for your work and personal life. PHASE 3: DESIGN YOUR IDEAL CAREER AND SEE WHERE YOU BEST FIT IN THE WORKING WORLD SO AS TO BE BOTH HAPPY AND SUCCESSFUL. The factors that go into a career decisions often compete. They are difficult to organize into a single direction or direction. By using both logical and rational (left brain), and non-logical and creative (right-brain) exercises, individuals identify possible directions to investigate. At this stage, participants may have 2 or 3 possible solutions to the career decisions they are dealing with. PHASE 4 : REALIZE WHICH OPTION FITS YOU AND YOUR SITUATION BEST. Direction and focus ultimately come from actual experience. The process of Phases 1 through 3 help individuals concentrate on paths that can be meaningful and fitting for them. In Phase 4, participants learn how to carry out systematic decision-making through carefully orchestrated research and actions. Each client eventually finds the best specific fit between themselves and a direction. In the later stages we focus on action planning and the job search. The process is led by certified Oxford career coaches. WHERE? You go through the program from the comfort of your own surroundings. You progress at times most convenient to you. EFFORT? We ask you to budget a minimum of 3 hours of time per week to achieve optimal results. A Personal Career Vision. We will design a powerful blueprint of your best possible future. Uncover Your Passions. Uncover what, deep down, you really WANT and provide you with a sense of optimism and purpose. Coaching. You are led by the program founder and another Oxford coach, start‐to‐finish. Our goal is to answer your most critical questions, inspire and support you to make the best possible decision, help you to get focused, stay motivated, and overcome obstacles, and help generate discoveries and breakthroughs. Discover Your Options. From starting over to being your own boss to leveraging your existing skills and experiences, you’ll learn of important career options that fit your situation – many of which you’ve probably never heard of. Career Recommendations. Very often we’re too close to our own situation to know what we should do. You need an outside opinion and you’ll get even more than you expect, including career recommendations coming from several tests, coaches, and your fellow participants. Career Decision Technology. Help you understand which option represents the best possible decision you can make. Exclusive tips and strategies. These tips and strategies about making career change easy are not available anywhere else because they come from people who have successfully gone through a career change. What would you prefer? Some “take this test and discover your dream job” scheme that is bound for failure? Or a proven, step‐by‐step experience that is extremely practical, honest, scientific, and inspiring? 1. More Complete. The Oxford Program is different because it offers the most comprehensive program available for adults who want to love their work: a one-stop, virtual shop offering the best in individual and group career counseling, career networking, and the most sophisticated and in-depth arsenal of testing and tools on the market. Read about the Highlands Ability Battery. 2. More Experienced. We're not just talking about training, credentials and years of counseling experience. We mean people who've been in your shoes. People like international career counselor and Oxford Program founder. A former-unfulfilled Wall Street executive, Steve quit a secure job to pursue his dream of coaching the Oxford University crew team. Who better to guide you through the challenges and fears of changing careers than those who've been there, done that, and come out successfully on the other side? 3. More Personal. We understand that each individual's situation is unique and cannot be solved with any simple, one-size-fits-all formula. We'll provide you with the counseling, services and tools tailored to meet your specific needs. 4. More Flexible. Life is too short to let a busy work and personal schedule keep you from finding a more meaningful career. Primarily an online service, the Oxford Program makes it easy for you to change your life from the convenience of your home or office, and at the times most convenient for you. 5. More Well-Rounded. While other services typically measure only one or two aspects of your nature, the Oxford methodology draws from a combination of tests and exercises that we've hand-picked for their accuracy and usefulness in uncovering all of the aspects essential to helping people find meaningful and rewarding work...all the aspects that make up your 'Natural Vocational Identity.' These include: Natural Talents Personality Work Values Natural Skills Interests/Passions Assets Environment Fit It's a whole-person approach that results in the highest likelihood of finding work you can love. And we have more success stories every day to prove it. Adults visiting our professional career coach website often wonder what it is that makes our career change guidance and methods so special or different from other sources of career help they've encountered in the past. We understand if you're skeptical regarding our professional coach services regarding your career. So, don't take our word for it. Look at the endorsements we have gained for our career counseling. As a client of the Oxford Program, you have a team of expert coaches working together to help you find your dream career solution. Steve is a master career coach. Rather than just reading about the career change process, Steve has lived it. He teaches from experience. Over 20 years ago, Steve walked away from a career as the youngest executive at a large Wall Street investment bank, and went to England to coach the prestigious Oxford University lightweight rowing team. After years of research, assembling the most sophisticated arsenal of tools known to the career counseling profession, and working with clients in his private practice, Steve developed the "Oxford Program" -- a truly superior career-discovery and selection methodology. For more than 20 years Lanie Damon has worked extensively with The Highlands Ability Battery, coaching and counseling clients through career decisions, and was one of the first facilitators of the Highlands Personal Strategic Planning Seminars. For the last year she has facilitated portion of The Oxford Program Career Change Bootcamp and coached individuals in the Premier Program. Lanie has worked with individual clients from numerous industries and at many career junctures. She is a career changer herself and her background includes education (secondary and undergraduate), recruiting, training, institutional sales in financial services, coaching and counseling. She is a licensed professional counselor in Georgia and holds a Distance Credentialed Counselor certification as well as coaching certifications. People that visit our website often wonder what it is that make the methods of the Oxford Program special or different from the other methods they may have encountered in books or with counselors. Many people have generally tried all sorts of approaches before finding out about the Oxford Program, and they have a natural skepticism because the other approaches they have tried are so unsatisfactory. Hopefully this FAQ will dispel those preconceptions and more clearly define why the Oxford Program is so effective and popular. We recommend that people spread the process out over 8 weeks. However, some clients with more urgent needs can complete the program in as short as 2 weeks. On average, we recommend having 3 hours per week for the program. The Oxford Program has a proven track record of generating results and satisfaction where other approaches failed. By looking at the page of testimonials and "success stories", you should get an idea of how wonderfully unique it is and how it can change your life. But it is still important that you understand for yourself that the Oxford Program is just what you are looking for. Therefore, please tell us about your situation and we'll give you our honest opinion about whether you have the type of situation that can benefit the most from the Oxford Program. Is online career counseling effective? Studies indicate that online, distance counseling can be extremely effective, especially with career guidance. Distance counseling tends to be more structured than face-to-face counseling, in addition to providing convenience and greater time flexibility. As a result, the counselor and client may be more focused and specific as they deal with issues and concerns. The Oxford Method, because it is so systematic and effective, takes advantage of the Internet much better than conventional career counseling. Is it possible to find work that is fun and make good money too? Yes! About 90% of everyone who joins the Oxford Program has the exact same concern. These are the same people making amazing discoveries and whose testimonials you can read. There's an all-too-common myth that finding work you love means starting over in something completely different as if you were a college student. But starting over like this is totally unnecessary for many people. There are so many possibilities, from leveraging your own education and experience, to combining careers into a career portfolio... people have so many more options and possibilities than they realize. In the Oxford Program, you will learn of strategies, options, and possibilities that make profound career satisfaction and significant financial income extremely do-able. Why pay for career guidance? The vast majority of career hunters try to find their way alone. They read books and take online personality/career tests and in the end, most still stay in the work they hate! Why? Most Internet-based career tests they take are often inaccurate and provide no concrete advice. They typically focus on only one aspect of the "whole picture" that makes up your nature. The process that the tests and books offer do not provide confidence that the recommended direction is the right one or that it is worth the risk. People often need an "outside" opinion to validate any career change decision. Remember, even Tiger Woods has a coach! Good career-related advice is very personal and the process must be highly-customized to the individual. Books and tests give broad descriptions and advice. Making a career change goes against our instincts which are to avoid change. We ALL need someone to motivate and encourage us to take the hard steps that are necessary to living a life less-ordinary. Should I spend my money meeting with a career counselor one-on-one instead? One of the differentiators with the Oxford Program is that we employ the Oxford Method. You won't find that method used with traditional career counselors. The Oxford Program is based on many of Steve Bohler's years of one-on-one counseling. One-on-one guidance is only part of the Oxford Program. Not only is the Oxford Program extremely cost effective, but it is inherently better than the vast majority of traditional counseling programs. We've found that the majority of career counseling engagements are not as complete as the Oxford Program. The Oxford Program is built using knowledge gained through experience with hundreds and hundreds of members and is far more complete than what you might get from meeting with even a great counselor. Is the Oxford Program suitable for people outside of the United States? "This programme and the revelations it reveals are relevant to what I would want to do anywhere in the world... These tests and the work one has to do in retrospect of one's life should be done as a matter of course: the Oxford Programme facilitates the action by providing the path when we cannot see the first step. Being a Brit is of no consequence to taking this programme - careers are much the same between here and the UK!" Are there any extra charges once I enroll? No. We may make some recommendations for books or ancillary materials, but they are merely recommendations and not an integral part of the Oxford Program. Do I have to be available at certain times of the day? You can complete the program entirely on your own schedule. Depending on your plan, one-on-one coaching calls or group coaching calls are scheduled at a certain time and day. See this page to read more about the plans and their respective costs. You can become a client here. The Oxford Program meets the standards set forth by the National Board for Certified Counselors for internet-based counseling. ✔ 3 Career Assessments including the CareerFitNow Analysis. ✔ Discover whether you need a career change or just a job change.